Transcript: Dan Schneider Video Interview (Part 2) from 9/30/2014. Dan Schneider: Now, the book ends with the last couple of decades of Woody’s cinematic output. You have it divided into a last two eras. What are the two eras? Give me a film, pro or con, that you think is the most representative, the best, the most interesting, what critics… whichever one jumps right out at you. So what are the last two Woody eras that you tackle? Alex Sheremet: The last two eras are 1993 until 2004, so that’s the films between Bullets Over Broadway…No, Manhattan Murder Mystery and Melinda and Melinda. And then I go from Match Point in 2005, up until 2013’s Blue Jasmine. Looking at the first time period, that film that I want to talk about most is Celebrity. This is because this is a film that’s been pretty much ignored, it’s been neglected, and in many ways it’s been much more panned, even, than Stardust Memories, or Another Woman, or similar films. It has not necessarily had this kind of revitalization like some other films might have, and it’s… I wouldn’t call it a great film. It’s not up to par with his best work, but at the very least, I would argue that it is an excellent film. It’s an excellent film for the very reasons that people deride it for. For example, you have the character of Simon, through Kenneth Branagh, and he’s been derided as this really poor Woody Allen stand-in, that he’s merely doing the Woody Allen shtick in a way that Woody Allen wouldn’t be able to do. Now, to be sure, I have never had much use for style guides. Yes, there was all the studying for the writing portion of the SAT, years ago, which required lots of rule-learning and — even worse — the application of said rules to poorly-written ‘answers’ that were anything but right. Yes, I’d been assigned the oft-banal Strunk & White’s Elements Of Style in college courses, and have, out of curiosity, perused a number of similar guides not only across form and genre (prose, poetry, non-fiction, sci-fi, grammar) but multiple languages, as well, just to see how the rest of the world, well, merely hypothesizes the sorts of things that are in fact REAL to me. For instance, I still recall reading Orson Scott Card’s How To Write Science Fiction And Fantasy, and finding — even as a 10 year old with a desire to impart stories — the thing too restrictive for anyone but the worst writers, to whom issues of mechanics and advice re: ‘world-building’ might narrowly apply. Thus, I was both intrigued and a little alarmed when I read the title of Steven Pinker’s new book. Now, don’t get me wrong. While admittedly a very good writer with MANY interesting ideas across the board, Steven Pinker is a thinking academic (as opposed an academic thinker! ), first, and has not, in his occasional comments on the topic, shown any deeper understanding of the arts. Yes, he’s constructed some great arguments, and pointedly done away with scientific fraud within the clarion of a mere sentence or two, but that does not really lend itself to art criticism. This is because the wisdom (not ‘knowledge’) immanent to recognizing a great poem, or the odd assortment of skills and luck that goes into differentiating a good from bad metaphor is nigh-indefinable. In short, while true creativity might be easy to quantify, if one merely KNOWS how to evaluate the works, themselves, its source in most cases isn’t. This means that no intellect, personal background, type, or force of character guarantees success in this endeavor, and Pinker’s book, to its credit, does not pretend otherwise. Transcript: Dan Schneider Video Interview (Part 1), via Cosmoetica. Dan Schneider: This is Dan Schneider, and this is the first Dan Schneider Video Interview. My guest is Alex Sheremet, a writer, poet, and film critic. We will be discussing his latest book on the film career of Woody Allen. Before we get into that, I just want to give a little word on the nature of the Dan Schneider interviews. Those familiar with Cosmoetica know that I’d done several dozen interviews in a written format. One of the things that I’ve found out in this day and age is that a lot of people don’t have the time, and a lot of people simply are not good enough with words to do interviews. So I’m trying now to put Cosmoetica and the interview series online on YouTube and this is the first of those interviews. Anyone who has ever saw the old television show Open End by David Susskind in the 1960s, this will sort of follow that format. Some interviews might be 40 or 45 minutes, others are an hour and a half, and others might run 2 or 3 hours depending on the subject matter and the interviewee. If you’ve ever watched the interviews at the Archive Of American Television, with television stars, we’ll follow that format. Basically, I’ll ask questions of the interviewee, who you will see on your screen before you. This is, again, Alex Sheremet, and this is being recorded on September 27th, a Saturday, 2014. Alex is a poet, a writer, and a film critic. He has a new book coming out from a new press, and is about the filmic career of Woody Allen. 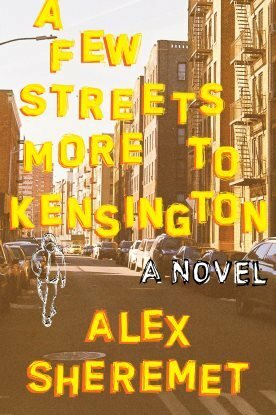 Alex, what is the name of the book, and what is the name of the press? 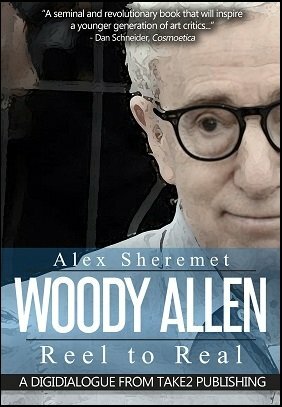 Alex Sheremet: The book is Woody Allen: Reel To Real, and the press is Take2 Publishing. DS: The book Woody Allen: Reel To Real…that suggests you may be doing more than just talking about the man’s filmic life. What is general thrust of the book, in just a few minutes?